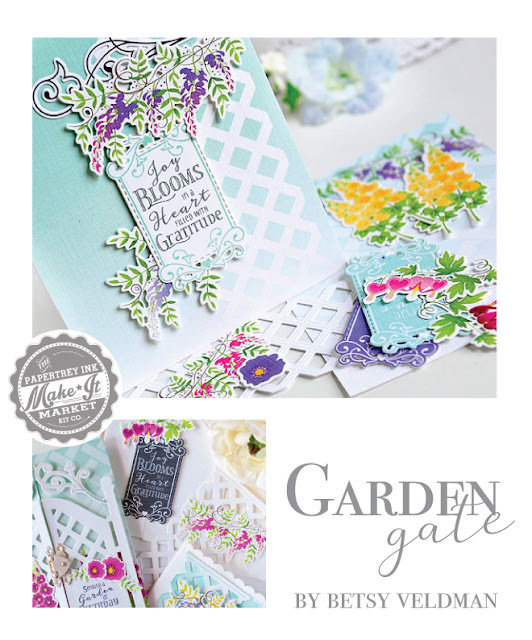 The next Make It Market Kit will be released on August 1st and it is entitled Garden Gate. There are so many beautiful basics that will speak to any flower or garden lover! 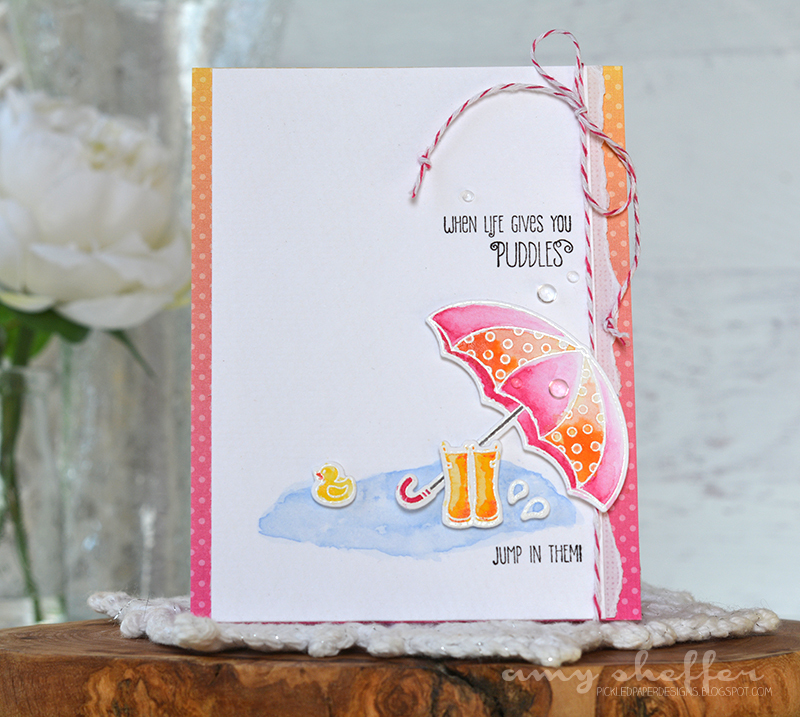 The colors in the kit are lush and pretty, just like a summer garden in full bloom. 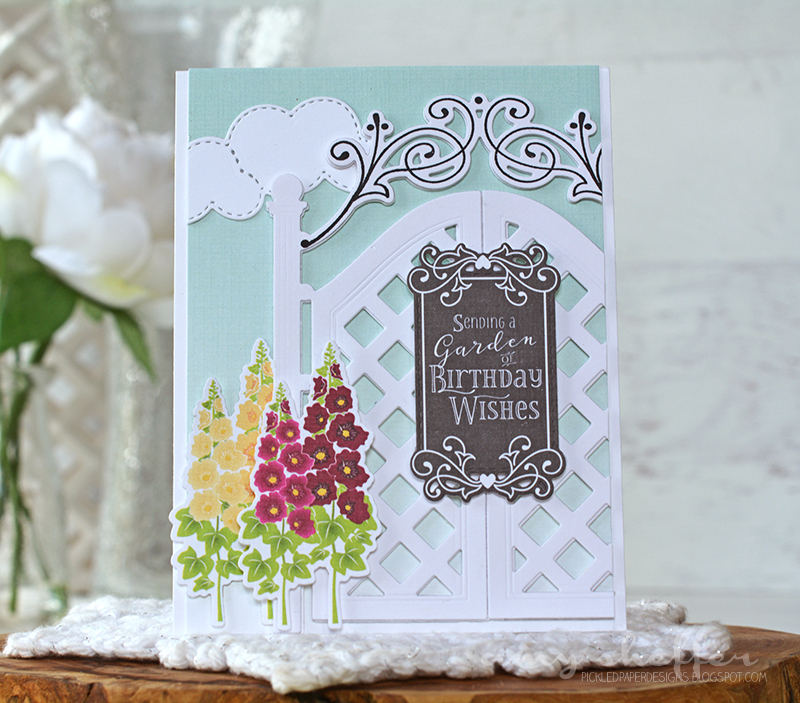 Garden Gate is filled with lots of options for creating stunning cards with some fun interactive possibilities. 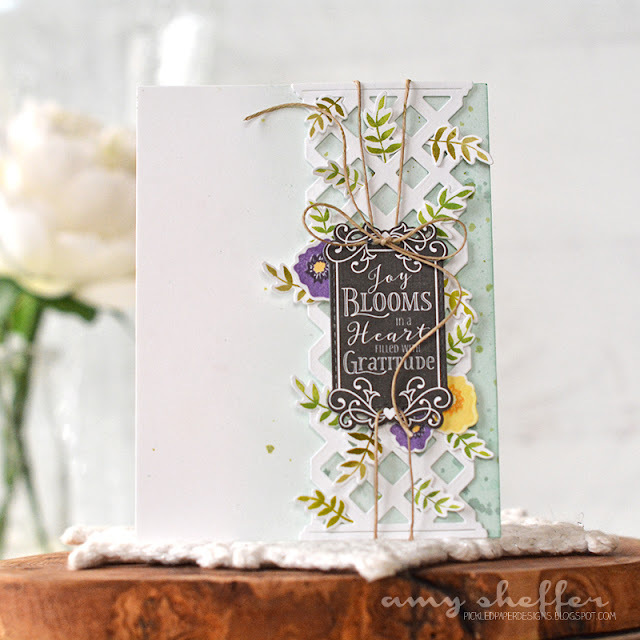 Old-fashioned flower favorites such as wisteria, hollyhocks, and bleeding hearts are included, and will surely make you feel nostalgic as you use them. 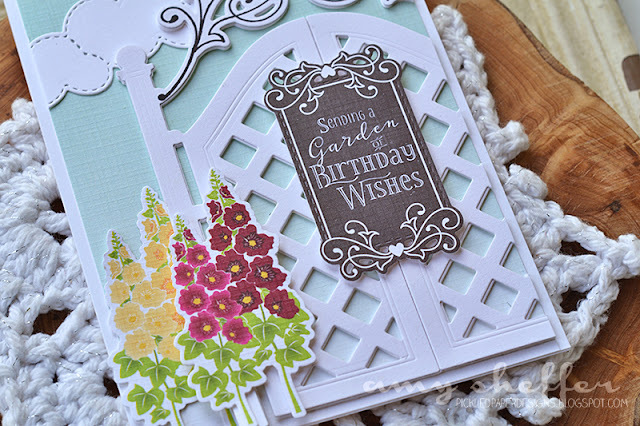 Pair these up with the coordinating dies to layer them over a garden gate, lattice, or even a wrought iron garden sign. The papers are cleverly designed to allow for gatefold cards, or you can cut them up to use for other design purposes. This kit is sure to be legendary and you won't want to miss out on the chance to add it to your collection! There will be a limited number of these exclusive kits available, so be sure to get yours on Monday! The "Garden Gate" Kit will be available for sale beginning on August 1st at 10 pm ET, only at Papertrey Ink. 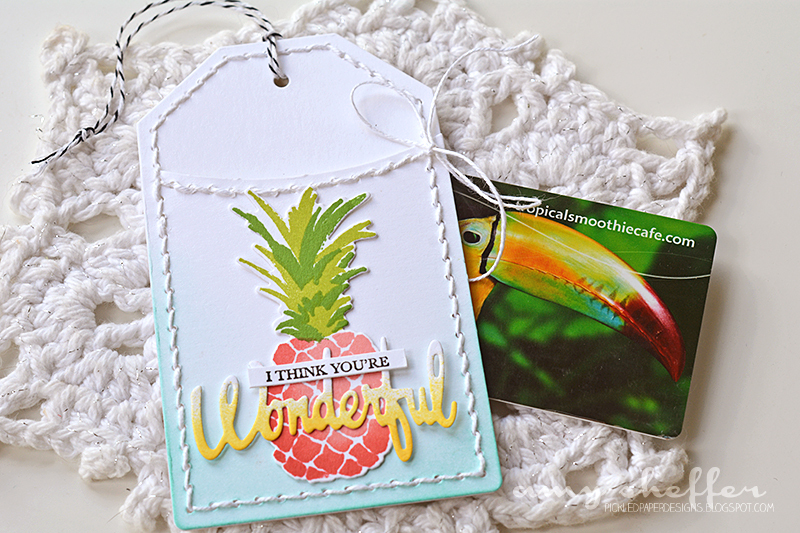 Read all the details on Nichole's blog or contact Customer Service with any questions. 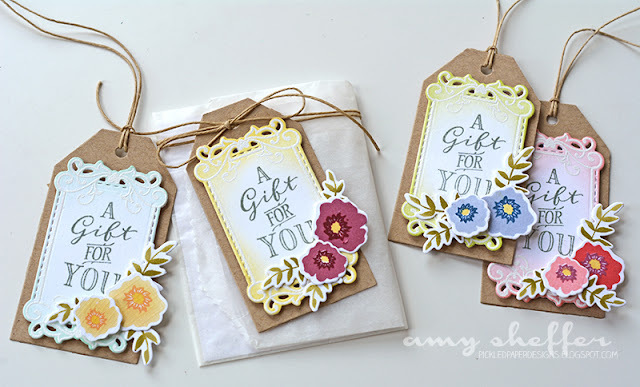 My first two projects make heavy use of the patterned paper and the convenient pre-printed die-cuts. With this first card, I'm picturing the beautiful and ornate iron work on the fences and gates in the Garden District of New Orleans. 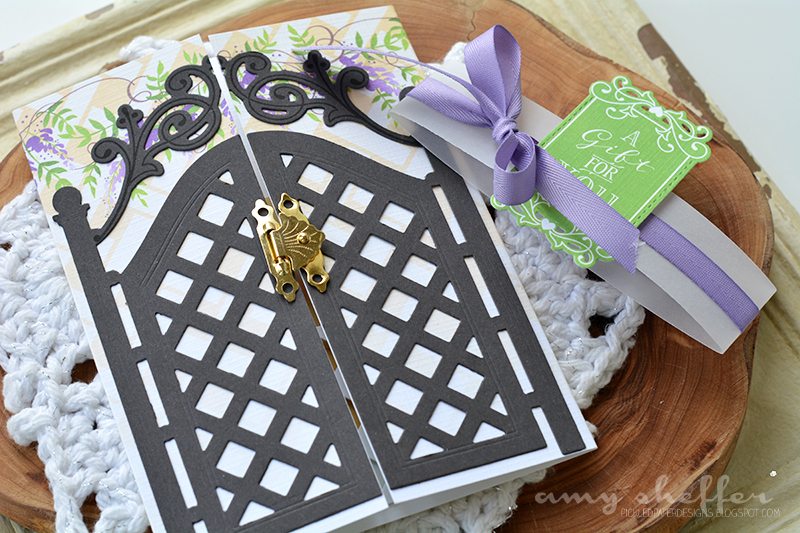 I die-cut the gate from Smokey Shadow and layered it over one of the gate-fold patterned papers. I used both a band and the Brass Gate Latch hardware for a closure. 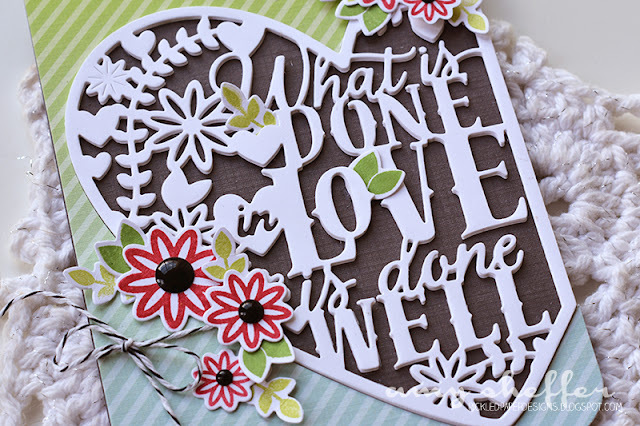 The sentiment is one of the pre-printed die-cuts. Here's a look with the band removed. You can see the gate latch (included in the kit) holding the gate closed. 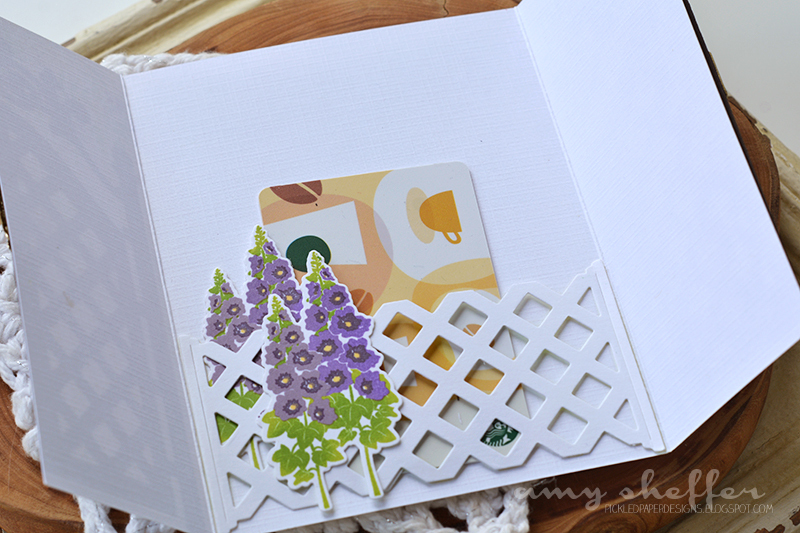 On the inside, I used a piece of the lattice die-cut as a pocket for a gift card. The hollyhocks are preprinted die-cuts. Here, I've stacked a couple of gate die-cuts for a little dimension, then offset the gate onto one of the patterned papers. 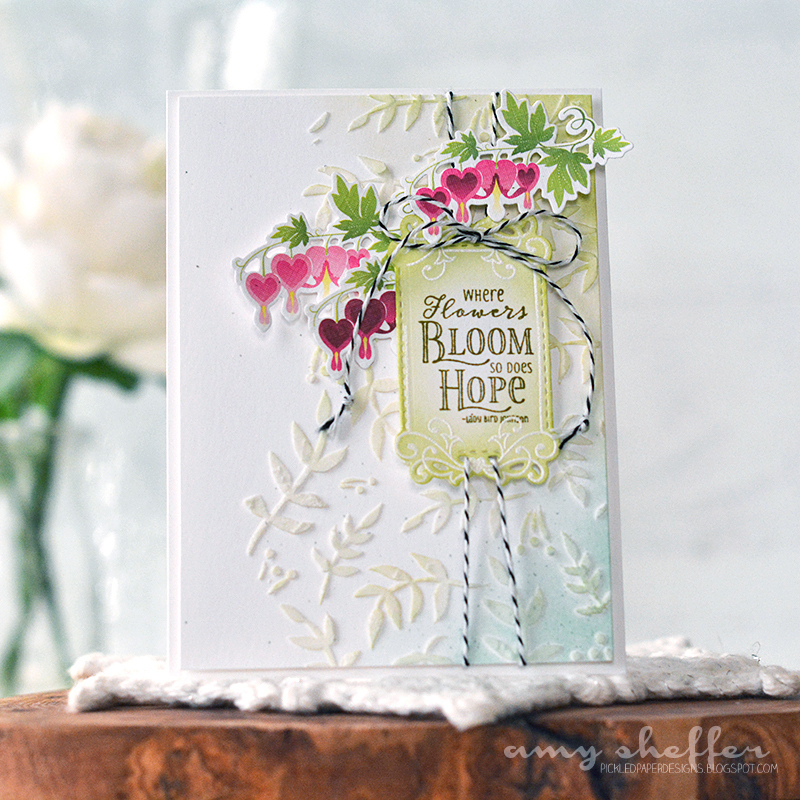 The hollyhocks and the sign are both pre-printed die-cuts. I always appreciate the pre-printed elements for quick cards! 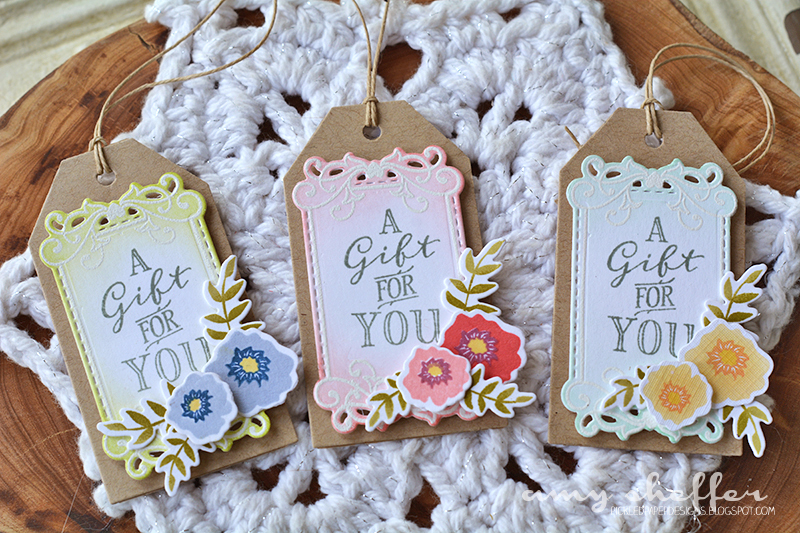 Next, I focused on the stamps mainly to create a set of pretty gift tags. Using the stamps, I was able to pull in some additional colors that aren't in the pre-printed designs. The tag bases are cut with the Minute to Make: Holiday Tags die. Each tag is topped with a stamped, white embossed, and ink blended sign from the Garden Gate kit, as well as a stamped and die-cut flower and leaf cluster. The glassine bag holds a gift card or similar sized item. 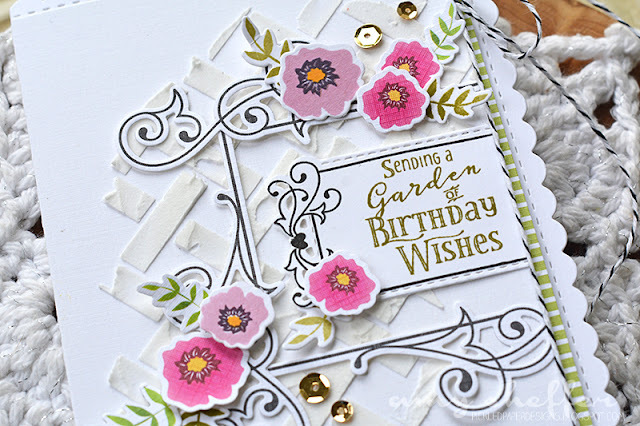 I just love the soft look of those sign die-cuts with the white embossing and ink blending! 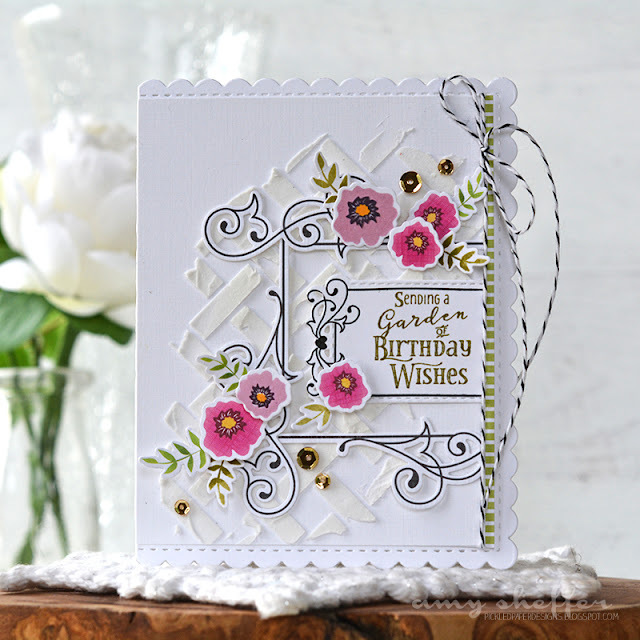 Such pretty scrollwork on that stamp! 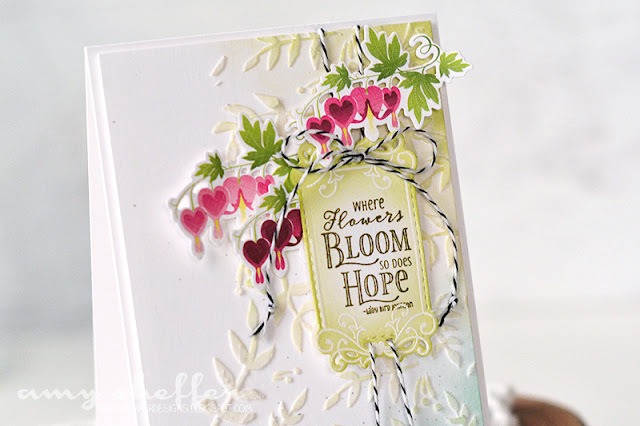 In the background, I used the lattice stencil and some white embossing paste for some tone-on-tone texture. The black scroll frame was made with three of the wrought-iron sign holder die-cuts. I just arranged them into a square and offset the arrangement to the right. 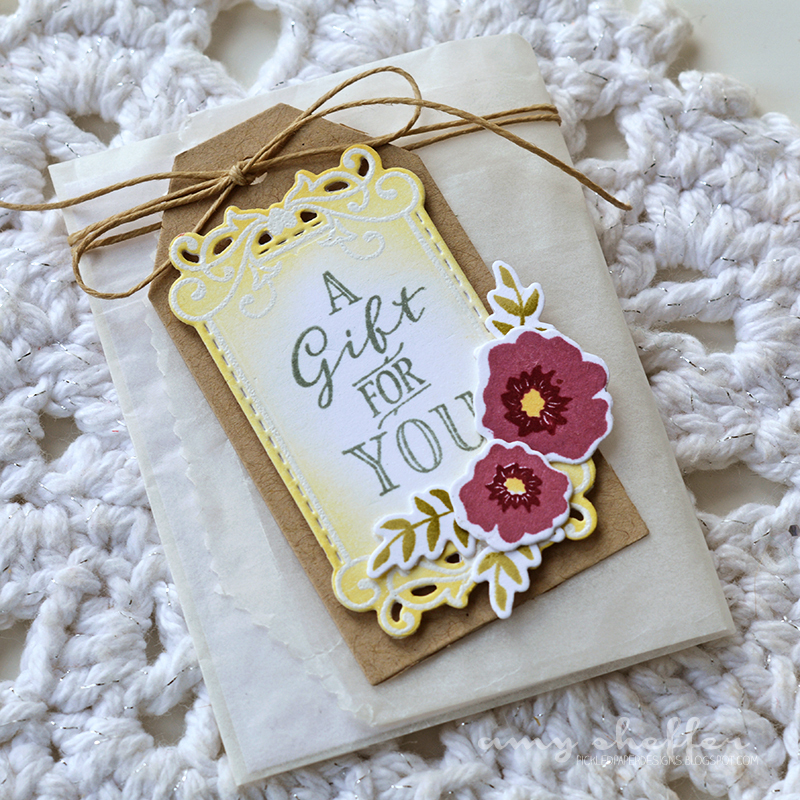 The sentiment is stamped onto a sign die-cut, trimmed down, and also off-set. 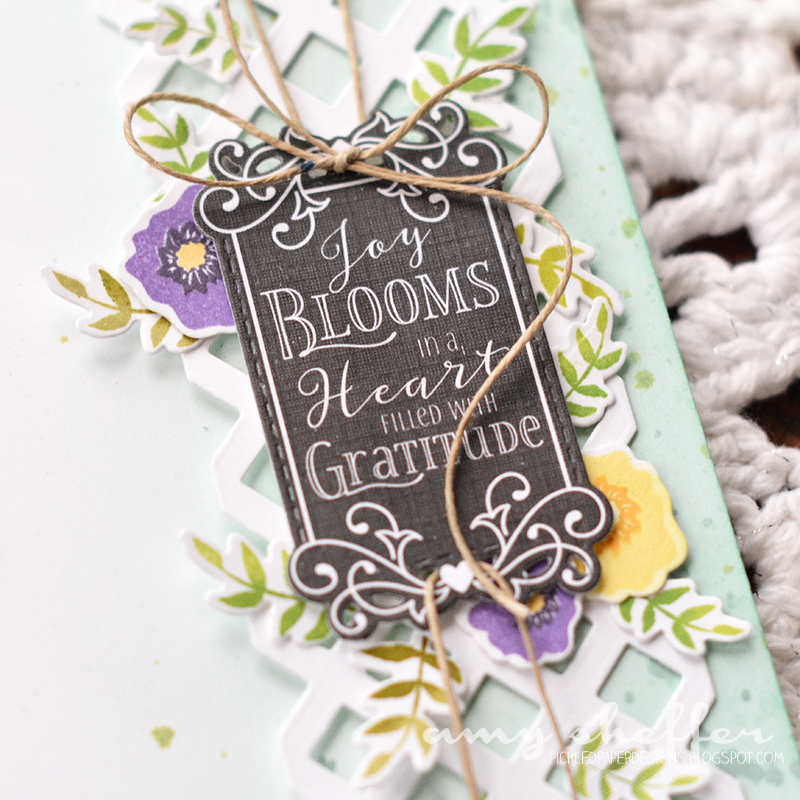 I mixed stamped flowers and leaves with preprinted flower and leaf die-cuts. Finishing touches were a strip of Green Parakeet patterned paper along the right, some True Black baker's twine, and some gold sequins. The card base is from the Noted: Scalloped A2 die set. 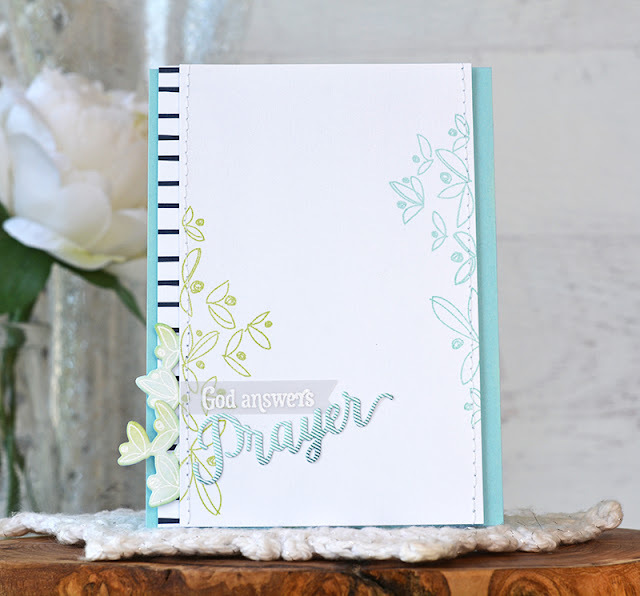 I made this background in a similar way, white embossing paste over the leaf stencil onto a white card stock, but this time I added some Aqua Mist, Spring Moss, and Green Parakeet ink blending and light splattering in the corners. 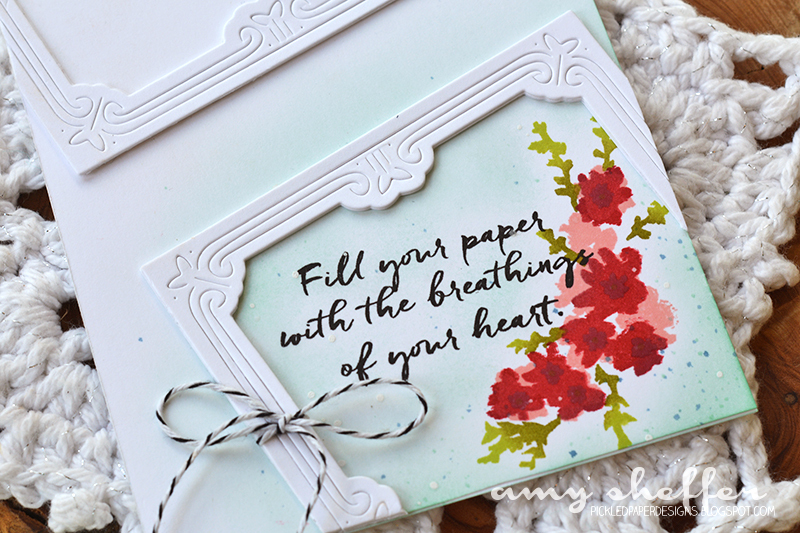 The bleeding hearts are pre-printed die-cuts. I stamped the sign scrolls and the sign sentiment. And then here's one last card for today. I'm telling you, with a beautiful and easy-to-use kit like this, I can't stop! Here I thought it would be pretty to create the look of flowers and leaves growing up a trellis. 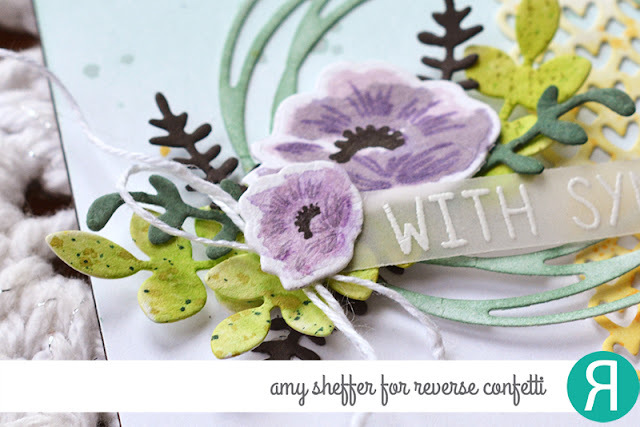 I stamped and die-cut a bunch of leaves and just tucked them into the trellis openings, added a few flowers, and tied on a preprinted sign for the sentiment. Before adhering it to the white panel, I did some ink blending and splattering to help the trellis stand out a bit more. 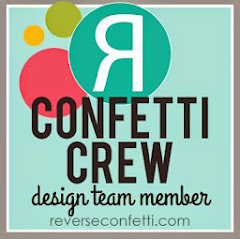 Please join me on the Reverse Confetti blog for this week's Wednesday in the Works feature. I'm sharing some tips for building floral clusters and bouquets. 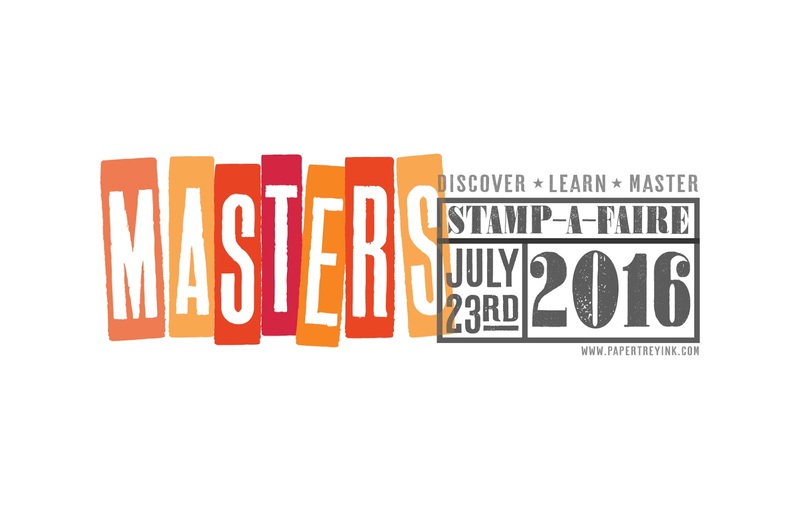 Papertrey's Stamp-A-Faire 2016 is nearing the half-way point. How's everyone doing? 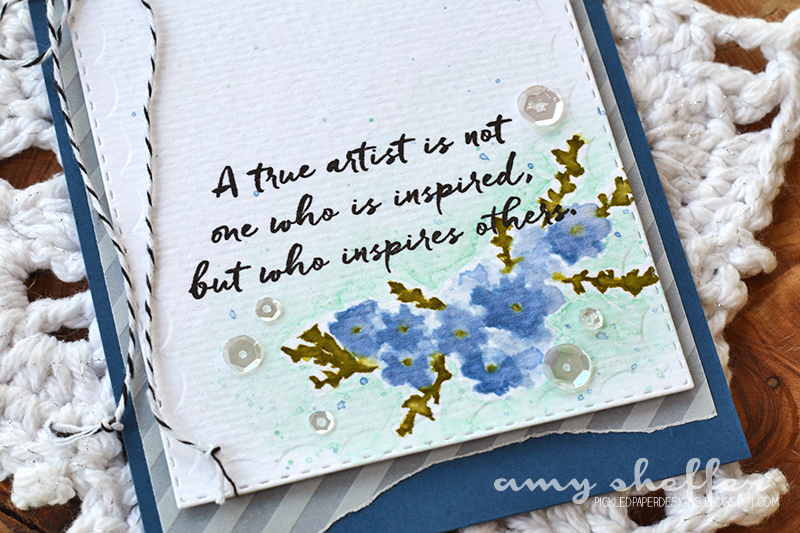 Our 2 pm challenge, Masterpiece Inspirations, features the whole team. 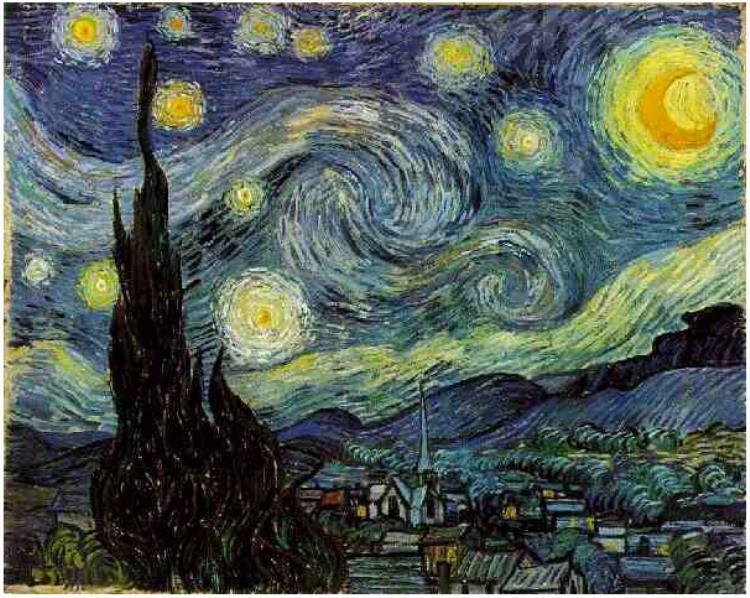 We were each challenged to choose a favorite master artist, then use one of his or her masterpieces as inspiration. There's a huge range of styles represented, so I hope you'll have as much fun with this challenge as we did! I chose Henri Matisse and specifically a work, La Gerbe, from his late period. In his later years, when Matisse became confined to bed or a wheelchair, he was unable to continue with his traditional painting and sculpting. That's when he began creating paper collages out of cut paper, or what he called "drawing with scissors." The cut-outs have an incredible emotional energy to them, and have become some of his most celebrated works. Matisse's story resonates so much with me because of its lessons on hope and persistence and never giving up. When faced with physical disability, he found new ways to express himself. I like to think of creativity as a force that can't be quashed, maybe redirected, but never extinguished. For my card, I began by painting swatches of paper in the bright colors of La Gerbe. Then I die-cut them with the branch die from Songbirds, and arranged the branches along the bottom, slightly radiating outward. 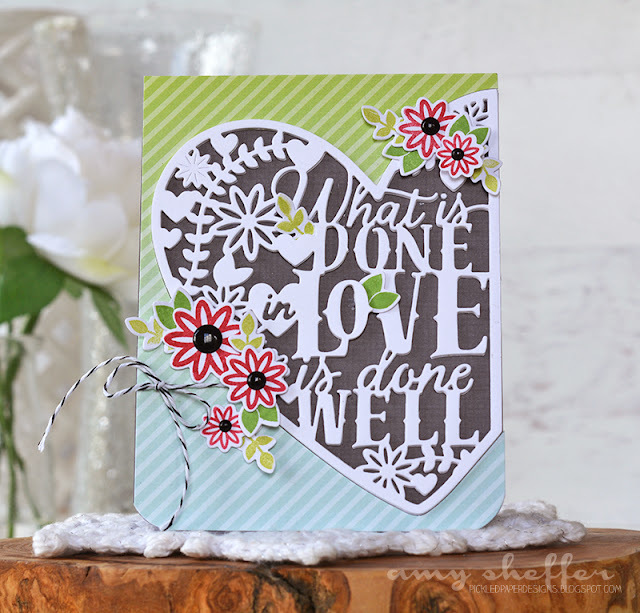 The sentiment was done with So Striking (stamps and dies). Today's Stamp-A-Faire event at Papertrey is well underway! We'd love to have you join us today -- for any or all of it. Our theme is The Masters. So far, today's challenges have included Master Color Recipes, Starry Night, and Gilded in Gold. Follow along with the full day's challenges over at Nichole's blog, which is where you'll also link up your projects. Each link list will be open until 7am ET Tuesday, July 26th, so you will have ample time to participate and photograph your projects. Vincent van Gogh wrote about the technical challenge of depicting a night sky: "It often seems to me that the night is even more richly colored than the day, colored with the most intense violets, blues and greens.... It's clear to me to paint a starry sky it's not nearly enough to put white spots on blue-black." In this tutorial, we'll apply a range of colors to create a rich and variegated night sky background. We'll begin with ink blending, follow with watercoloring, and finish with acrylic paint. 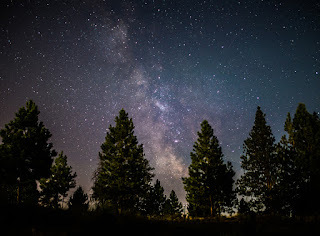 I'll also show you how to create tree silhouettes along a horizon line for an easy way to complete a night scene." I hope you'll play along! Remember, the link-up is HERE on Nichole's blog! 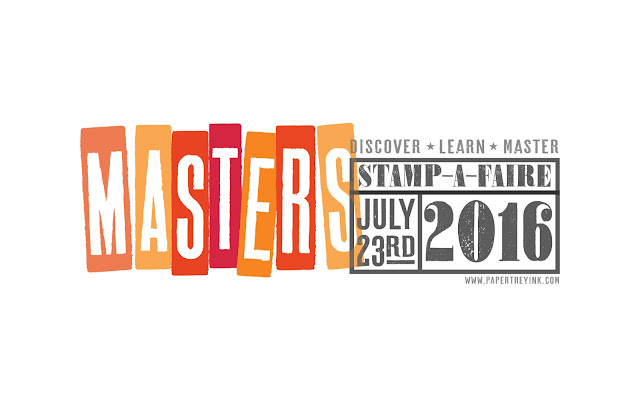 Papertrey's annual online stamping event, Stamp-A-Faire, is almost here! 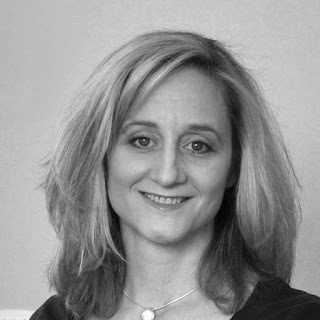 The official welcome and kick-off takes place tonight at 7 pm on Nichole's blog. Tomorrow, we have a full day of challenges prepared around our theme, The Masters. I hope you're ready to stamp with us! Today, the Papertrey team is sharing projects made with this year's SAF exclusive set, a beautiful floral and sentiment set called Art With Heart. 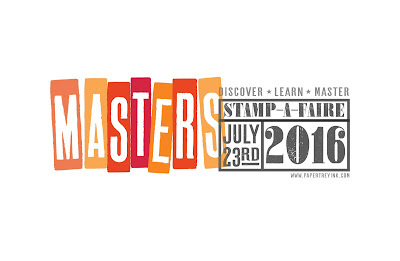 Art with Heart will ONLY be available on Stamp-a-faire day to all customers who make a qualifying $100 purchase. All orders made between 7am ET and 11:30pm ET on Stamp-a-faire Day tomorrow (July 23, 2016) that total $100 (before shipping) will receive the set for FREE! You will still earn Rewards Points on your order too, so it's an amazing offer! Please email Papertrey Ink Customer Service with any further questions. The bouquet in Art With Heart is one of the easiest layering stamp sets I've ever worked with, and the loose, watercolor look of the flowers is absolutely dreamy! I'm especially inspired by the art-themed sentiments, which are sure to appeal to those of us who create our art with stamps and ink. The floral bouquet is stamped primarily with Pale Peony and Pure Poppy. The flower centers and slight shading on the red flowers was done with Autumn Rose. The greens are done with Simply Chartreuse and shaded with Ripe Avocado. I did some Aqua Mist ink blending in the corner and added some Ocean Tides, Aqua Mist, and white splatter before highlighting the focal point with a pair of stacked white frames from Pretty Frame. Next, I wanted to enhance the watercolor look of the flowers with some actual watercoloring. 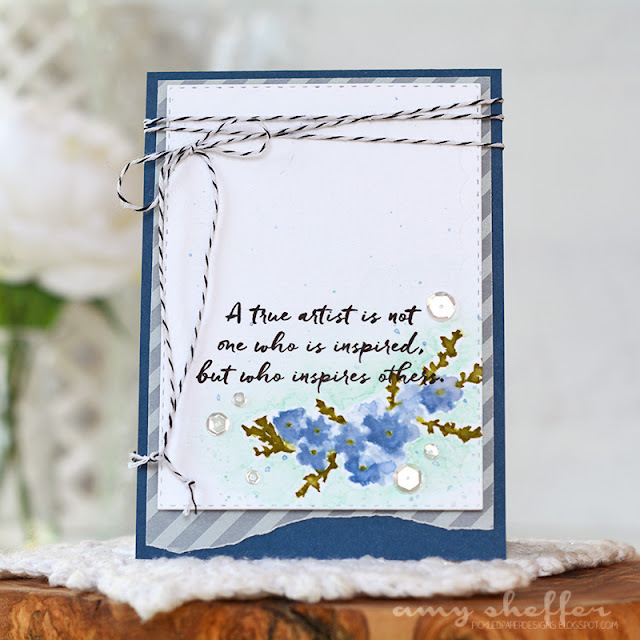 I stamped the flowers in Spring Rain and Blueberry Sky onto watercolor paper, using a small brush and water to move the color around. When everything was dry, I stamped the leaves in Ripe Avocado and painted over them with water as well. Last I watercolored around the bouquet with Aqua Mist and stamped the sentiment. 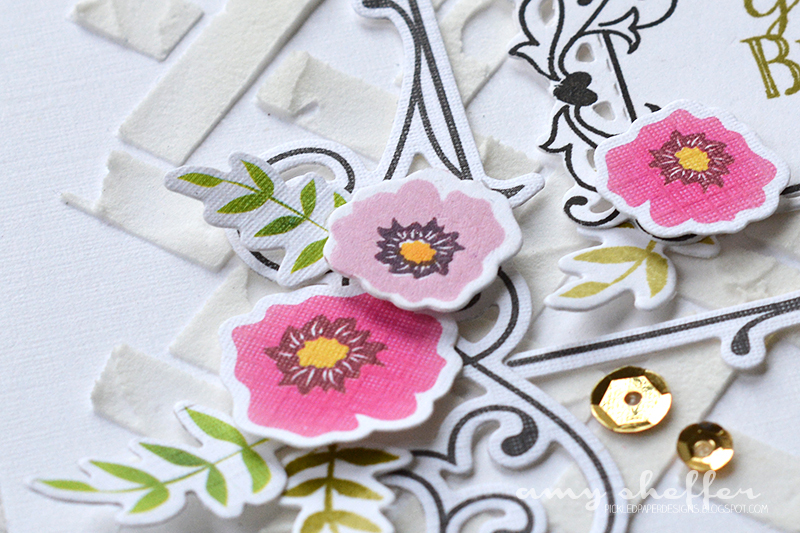 I die-cut the watercolor panel with one of the dies in the Noted: Scalloped A2 collection for that pretty stitched and dry embossed edge detail, then layered onto striped vellum and adhered to an Enchanted Evening card base. Papertrey's July release day has arrived! All of the new products the team has been showing the last few weeks will be available at 10 pm ET in the Papertrey Ink store. 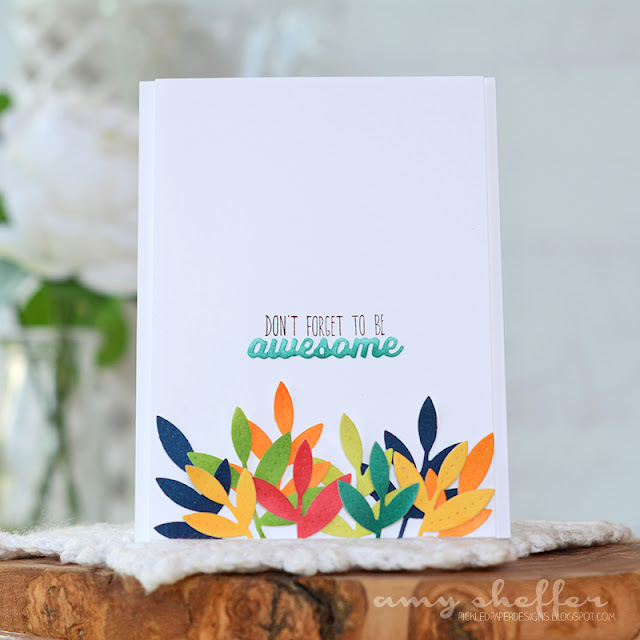 It's the Thought, designed by Dawn McVey, has the best sentiments! 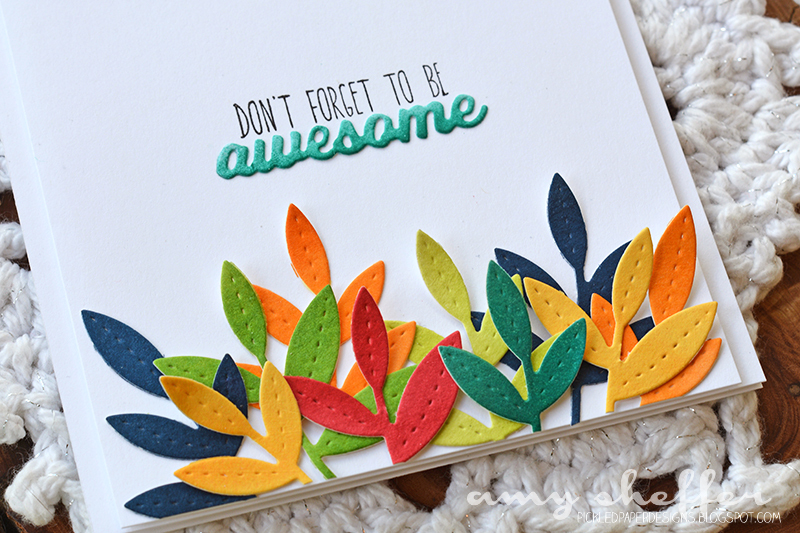 I especially like word die-cuts that go with "I think you're ..." -- wonderful, amazing, brilliant. 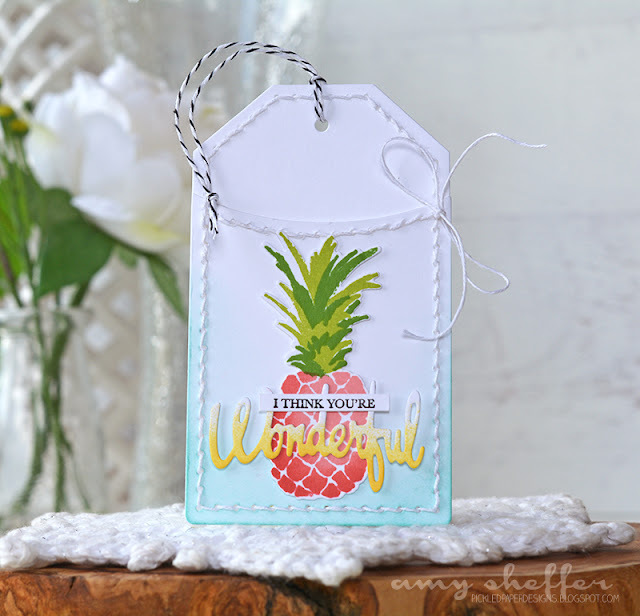 I layered the sentiment over a pink pineapple (from Some Like It Hot) and placed it on a Stitched Tag. The Stitched Tag pocket holds a gift card perfectly. Another idea is one of those little drink packets that you dump in the water bottles. Something tropical would be really cute with the pineapple. That would make a cute teacher treat! 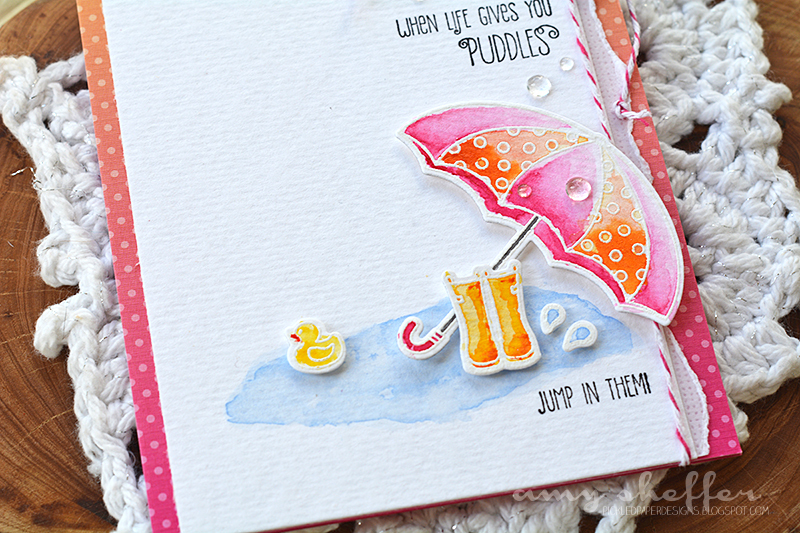 Here's my take on Betsy Veldman's adorable Dress Up Dolls: Rainy Day. The images are heat embossed in white and watercolored. 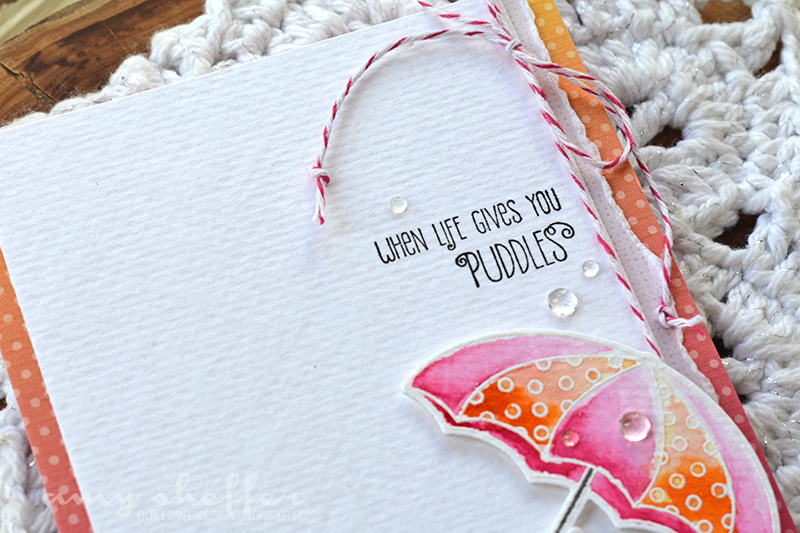 The polka dot background paper is from the Sunshine & Rainbows Make It Market Mini Kit. 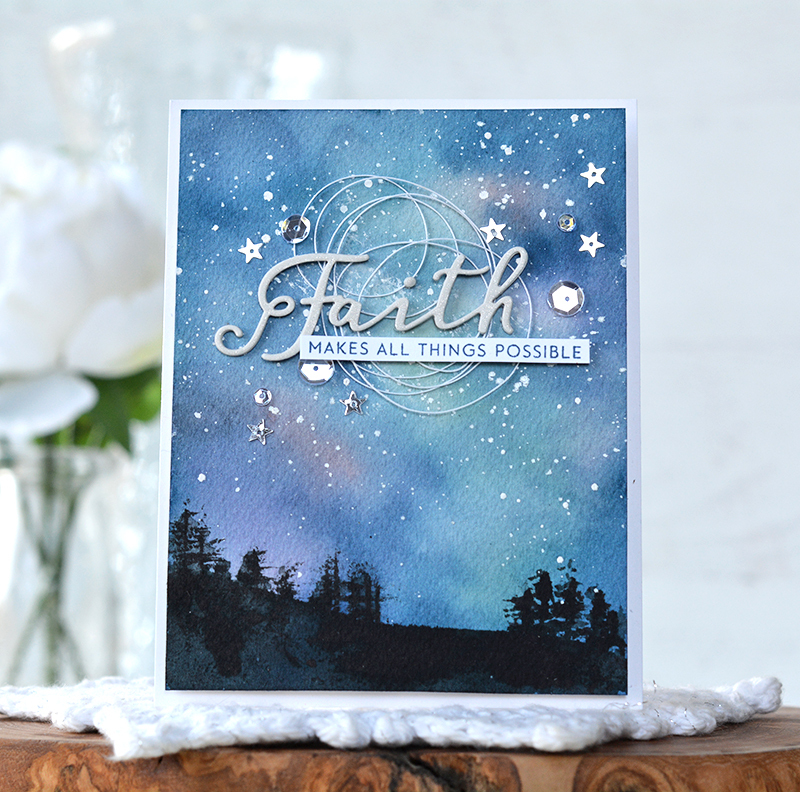 So many possibilities for the Background Basics: Galaxy set that Lizzie Jones designed. 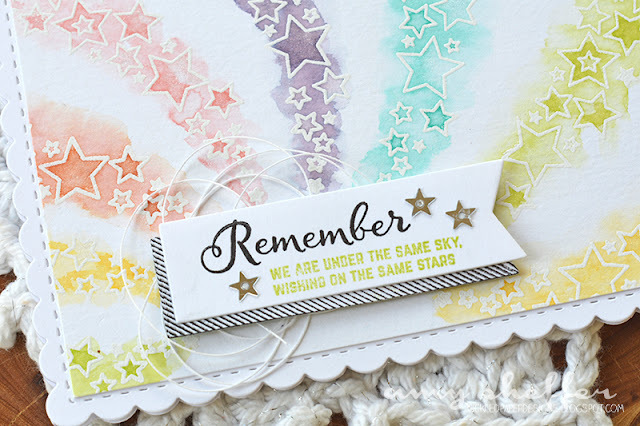 For today's card, I watercolored over white embossed starbursts in pastel rainbow colors. 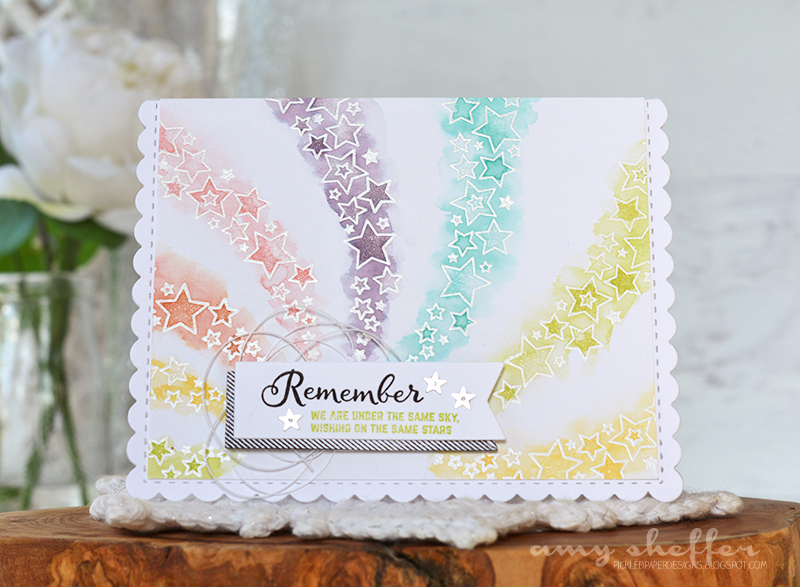 Number the Stars, by Lizzie Jones, is a fantastic sentiment set! This quote is especially meaningful. 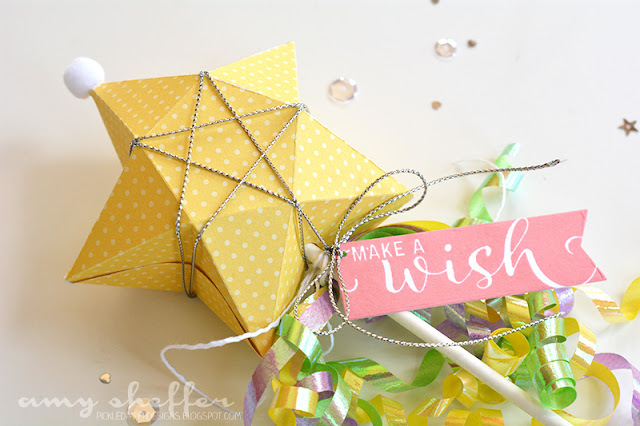 Lizzie also designed the Star Gift Box die. 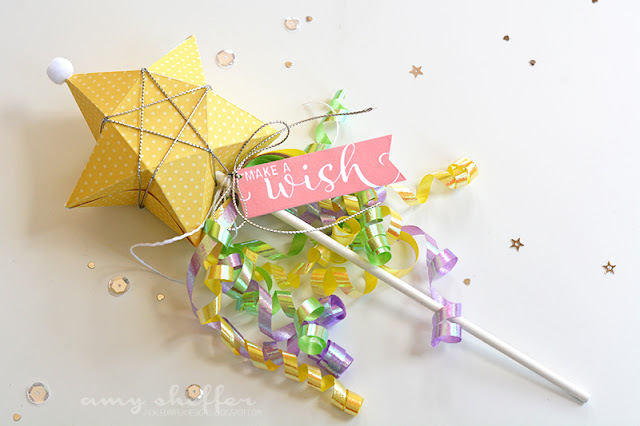 I immediately thought of using a star box as a magic wand. Wouldn't these make adorable party favors for a little girl's birthday party? 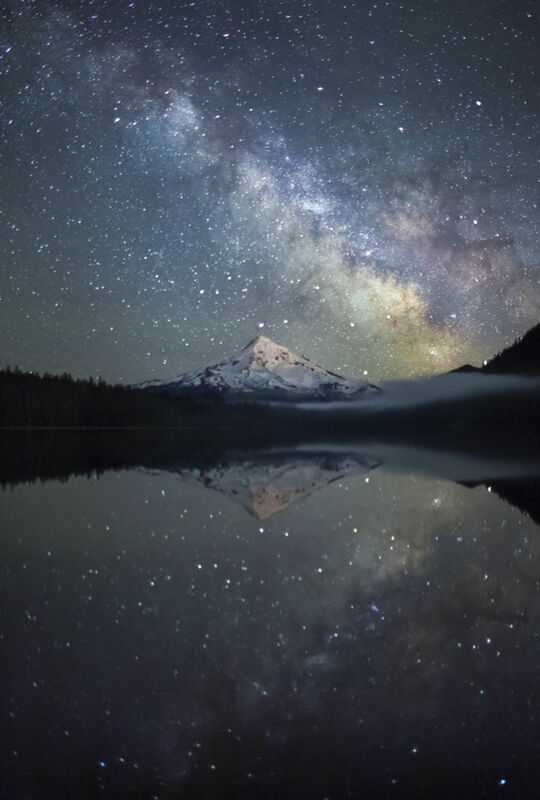 The sentiment is another one in the Number the Stars set. Done In Love is the newest in Betsy Veldman's Paper Clippings series. Love the offset heart! To make this, I first die-cut the paper clippings out of a blue and green striped pattern from the Sunshine & Rainbows Make It Market Mini Kit. I used the actual blue-green die-cut on another project and the negative here. I stacked a few white die-cuts and inlaid them inside the heart opening. 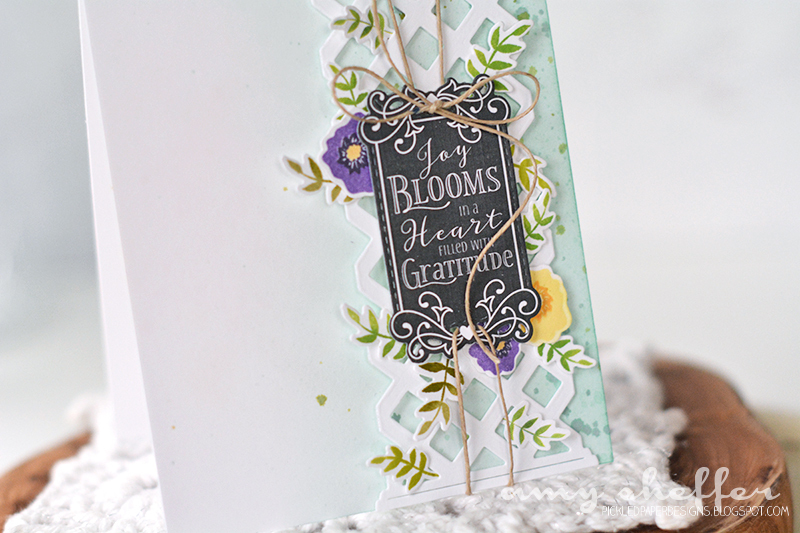 The gray panel behind the heart is one of the patterns in Dawn McVey's Floral Sketches paper collection. I've used Splits: Best Wishes for the stamp borders and Inspired: Prayers for the sentiment. For the word die-cut, I first stamped the striped banner image rom Background Basics: Galaxy, then die-cut the word out of it.